Doctor Who: Looking back at MAWDRYN UNDEAD | Warped Factor - Words in the Key of Geek. 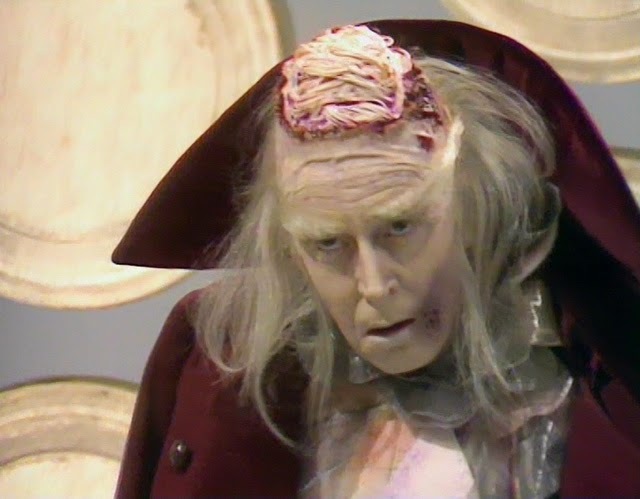 On the anniversary of its debut broadcast Christopher Morley looks back at the Fifth Doctor adventure, Mawdryn Undead. Season 20 of Doctor Who was notable for a number of reasons. It marked the twentieth anniversary of the beginning of the Doctor's travels in time & space, & featured return appearances by several of the friends & foes he'd taken aboard the TARDIS/faced off against across his previous four incarnations! Beginning 22 years ago today, on February 1st 1983, Mawdryn Undead saw the Black Guardian return for the second of three prominent cameos in a loose trilogy- his malevolence first making itself known to the Doctor's previous self in The Armageddon Factor. "We can't be too careful, can we? And it would be a terrible tragedy for the universe if it suddenly turned out that I was colour blind. 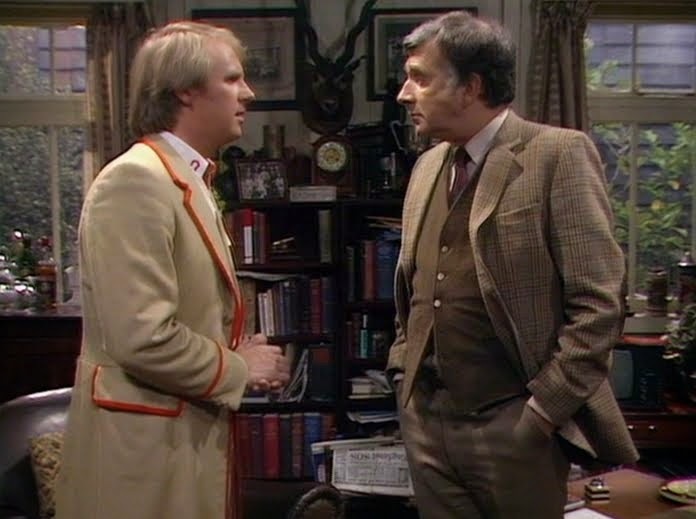 Unable to distinguish between the White Guardian and the Black Guardian...."
Taking class it's the now-retired-from-UNIT Brigadier Lethbridge-Stewart! He & the Doctor have shared some times, stretching back to when the Brig was but a Colonel. KNIGHT: Evans didn't mention any other survivors. COLONEL: No, well, it all got a bit confused. Driven into a side tunnel, myself. After that, got a bit lost, and then found this Doctor. DOCTOR: Yes, I was wondering when you where going to get around to me. KNIGHT: Yes, well, the Professor's spoken for him. We do know a little about the Doctor already. COLONEL: I see. In fact, more than you do about me, eh? KNIGHT: To tell you the truth, sir, yes. TRAVERS: Oh, my dear fellow, am I glad to see you! DOCTOR: My word, it is. It's been a long time. COLONEL: Professor, I'm told you know this man. TRAVERS: Huh? I'd have thought that was obvious. And if it comes to that, who are you? COLONEL: Colonel Lethbridge-Stewart. New C.O. So you can vouch for the Doctor here? TRAVERS: Well, of course I can. BRIGADIER: I beg your pardon? DOCTOR: What would you say if I told you I was looking for my TARDIS? DOCTOR: What about our time together with UNIT? DOCTOR: So you do remember. BRIGADIER: UNIT is a secret organisation. If you are aware of its existence, you would almost certainly have signed the Official Secrets Act. DOCTOR: Is there somewhere we could talk? This is so much more than an old pals act though! For one thing there's Mawdryn, an alien scientist who's been toying with the secrets behind regeneration & along with his followers, cursed to in theory live forever in a constant cycle of change. Looks like the Doctor might have to give up his remaining regenerations! After Mawdryn's finished pretending to be him, of course- having initially fooled Tegan & Nyssa. NYSSA: Regeneration? You don't mean it's happening again? MAWDRYN: It is life without end or form. Changing, changing. NYSSA: We've lost the Zero Room, Doctor. Is there any way we can reconfigure? MAWDRYN: Do not be afraid on my account. I will regain strength soon, but for the moment my mind is clouded. You understand the navigation? NYSSA: Well, a bit. At the moment we're still aligned with the ship. MAWDRYN: Oh, that is well. Prepare to leave at once. NYSSA: We can't leave without Tegan. NYSSA: Doctor, you don't know what you're saying. Tegan'll be back soon. In a stroke of luck the Doctor soon figures out what's going on, too. DOCTOR: Don't you see, Brigadier? The TARDIS came to Earth in 1977 and so did the transmat capsule, carrying someone from that ship in space. BRIGADIER: And Tegan and the other girl think, or rather thought, it was you. DOCTOR: Indeed. And what did you think? BRIGADIER: You mustn't make me remember. DOCTOR: You must. I need the information to protect Nyssa and Tegan. 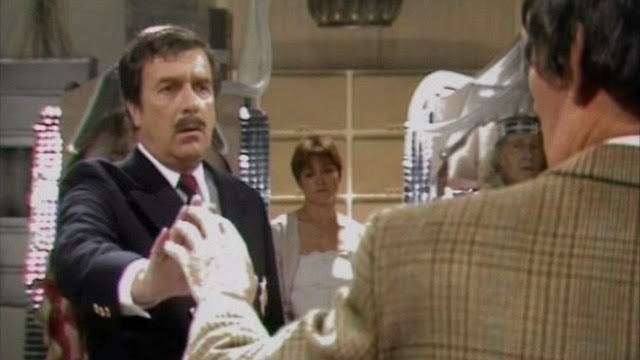 BRIGADIER: Even if I wanted to, I simply couldn't recall it. DOCTOR: That experience could be the reason for your nervous breakdown. BRIGADIER: Good heavens. Do you think so? And the solution is mind-bending, if a bit obvious for someone of the Doctor's obvious intellect! 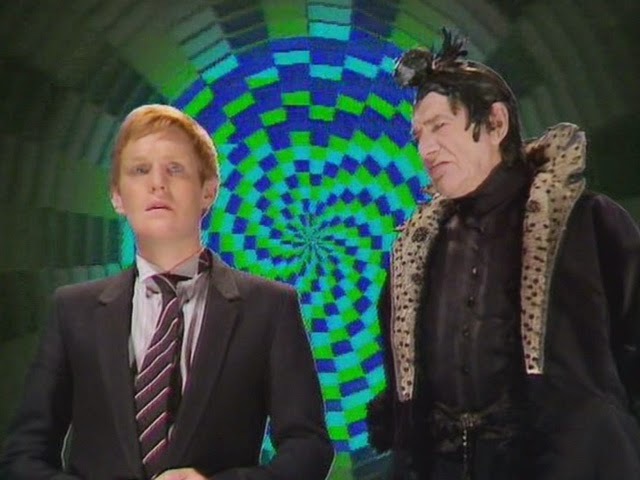 DOCTOR: Turlough, would you check to see if the transmitter's functioning? Tegan and Nyssa can use the beam as a beacon. If all goes well, the TARDIS should reappear. Ah. Brigadier, quickly, think. Did you go into the TARDIS with Tegan and Nyssa? BRIGADIER: I can't remember. Does it really matter? DOCTOR: Of course it matters. Can you imagine what would happen if you walked out of the Tardis in 1977 and met yourself in 1983? 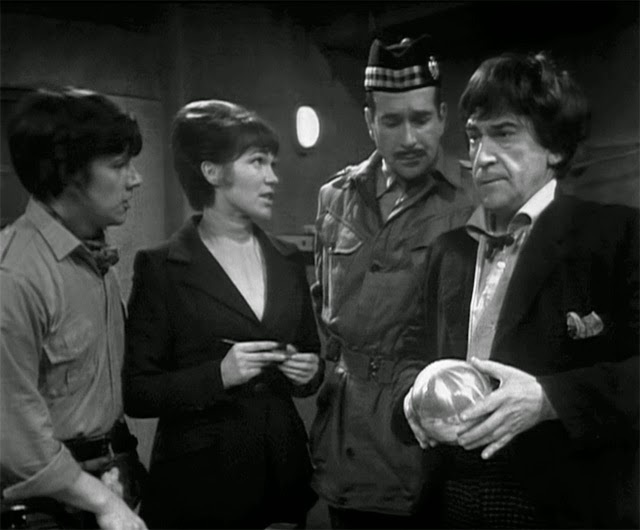 DOCTOR: It's not ridiculous, Brigadier, almost certainly catastrophic. BRIGADIER: What, do you mean that I could be two people? DOCTOR: Obviously. You'd exist twice over. And if the two of you met, you'd short out the time differential. Don't you see? The Blinovitch limitation effect? Oh dear. As Tegan would say, zap! 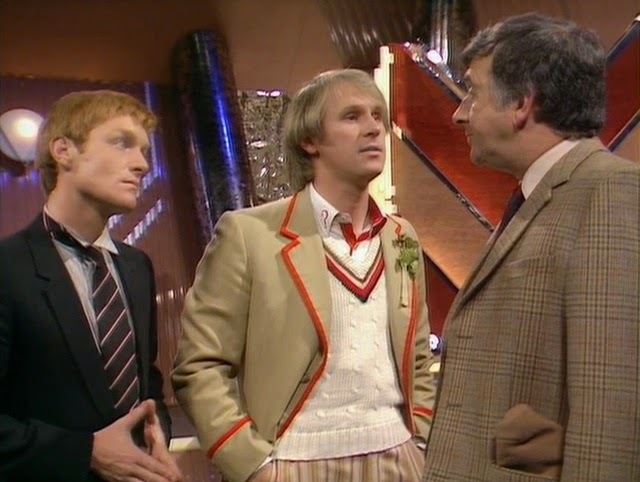 So begins Turlough's run as a companion & potential assassin, & he/the Doctor will meet the Black Guardian again in Enlightenment. "Chaos will come again, and the universe will dissolve!"